Mouse anti Human CD62e antibody, clone CL2/6 (MCA1969) used to affect CHO-P cell adhesion to selectin bearing substrate under shear stress conditions. MSC-PPG-19Fc[FUT7+] binding to P- and E-selectin in microfluidic flow chamber A-B. 2-5×106 MSCs/mL immobilized with either 100 μg/mL 19Fc[FUT7+], 100-200 μg/mL anti-P-selectin mAb G1 or 100-200 μg/mL anti-E-selectin mAb CL2/6 were perfused over either P-selectin bearing CHO-P cells at a wall shear stress of 1 dyn/cm2 (panel A) or E-selectin bearing stimulated HUVECs at 2 dyn/cm2 (panel B). Only the MSC-PPG-19Fc[FUT7+] cells bound the selectin bearing substrate. Cell interaction was specifically blocked using anti-PSGL-1 mAb KPL1, anti-P-selectin mAb G1 or anti-E-selectin mAb CL2/6 as indicated. Data are mean ± SD for 3-4 independent experiments. * indicates P <0.001 with respect to all other conditions. C. Cumulative rolling velocity plot showing median rolling velocity of 3 μm/s when MSC-PPG-19Fc[FUT7+] roll on P-selectin/CHO-P cells at 1 dyn/cm2 and 11.5 μm/s for rolling on E-selectin/ HUVECs at 2 dyn/cm2. The rolling characteristics of 190 cells were analyzed and binned from three independent runs. 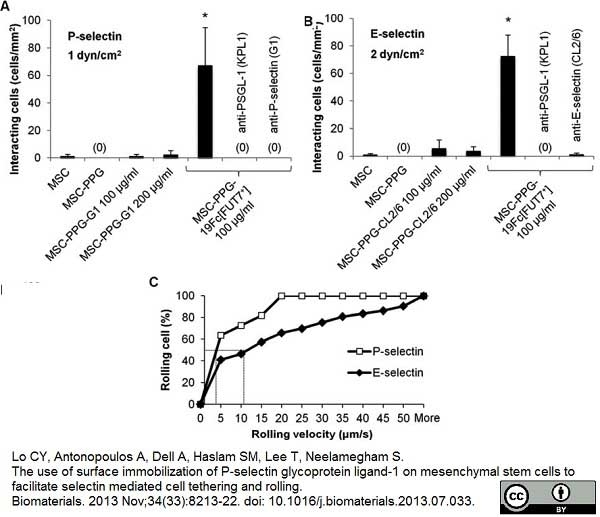 From: Lo CY, Antonopoulos A, Dell A, Haslam SM, Lee T, Neelamegham S.
The use of surface immobilization of P-selectin glycoprotein ligand-1 on mesenchymal stem cells to facilitate selectin mediated cell tethering and rolling. Mouse anti Human CD62E antibody, clone CL2/6 recognizes human CD62E, a member of the selectin family which is expressed on endothelial cells at sites of inflammation. Mouse anti Human CD62E antibody, clone CL2/6 has been shown to inhibit the binding of human neutrophils to stimulated HUVECS. Abbassi, O. et al. (1993) E-selectin supports neutrophil rolling in vitro under conditions of flow. J Clin Invest. 92 (6): 2719-30. Kishimoto, T.K. et al. (1991) Antibodies against human neutrophil LECAM-1 (LAM-1/Leu-8/DREG-56 antigen) and endothelial cell ELAM-1 inhibit a common CD18-independent adhesion pathway in vitro. Marin, C. et al. (2011) Mediterranean diet reduces endothelial damage and improves the regenerative capacity of endothelium. Am J Clin Nutr. 93: 267-74. Rius, C. et al. (2010) Trans- but not cis-resveratrol impairs angiotensin-II-mediated vascular inflammation through inhibition of NF-κB activation and peroxisome proliferator-activated receptor-gamma upregulation. Nieuwland, R. et al. (2000) Cellular origin and procoagulant properties of microparticles in meningococcal sepsis.